It’s that time again! Just after you’ve gotten all geared up for Winter, Spring is right around the corner. Remember Spring? That lovely season where it’s not too hot or too cold? Ah yes, spring! And yes, it will be over before you know it. But not to worry, Scorpion has just dished out two new pieces for 2014 that will keep you cool right into summer. Get ready for the Women’s Vixen Jacket and the Women’s Solstice Gloves! 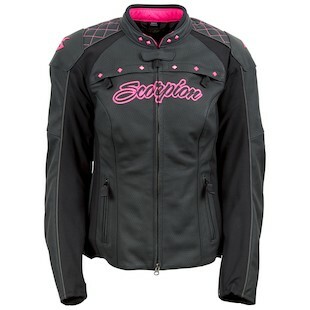 The Vixen Jacket is Scorpion’s newest foray into summer leather jackets for 2014, and boy, have they started with a bang! The Vixen is all attitude. So foxy, we’re not even sure where to begin! Take, for example, the pink colorway of this jacket. When you think pink, you also think flowers and frills. But, the electric pink pyramid studs and plush diamond patchwork will make you think again. And what’s under all that ‘tude? Nothing short of SCL-1 CE approved Sas-Tec elbow and shoulder armor with the option to upgrade the back protection. The shell itself is also constructed of 1.2-1.4 mm Monaco top-grain leather. Leather is clearly the safest when it comes to abrasion resistance, but it also blocks wind. So to make the jacket more warm-weather friendly, there’s also quite a bit of perforation along the chest, back, torso and arms. The Scorpion Vixen won’t let you down in the Fall months either, thanks to its removable Everheat insulated quilted liner. You’re looking at a great leather option for Spring, some Summer, and all of Fall. Alternatively, simplicity is key when it comes to the new Women’s Solstice gloves. 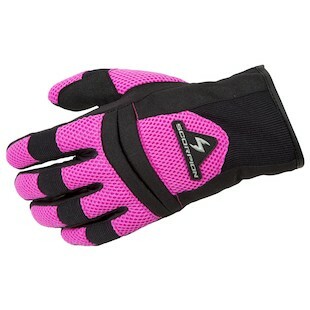 With a mesh base construction, the Scorpion Women's Solstice is an entry-level glove designed to flow lots of air along the back of your hand while providing coverage on impact areas such as the knuckle and palm. Perfect for those hot summer days and available in hot pink for added sass with your Vixen. Reynards beware, Vixens are here!